Last year Andrew Willis used Search and Maps to turn his love for skateboarding into something that could bring a community together: his skatepark, Frontside Gardens. Here is his story. -Ed. Andrew (“Andy” to his friends) has been a passionate skateboarder for as long as he can remember. To make his dream of building a skatepark for his community come true, in 2012 Andy entered a competition to lease a piece of land in Hackney Wick, in East London. He won—then realized he had no budget to build his dream. Using Search and Maps, Andrew found a wealth of reclaimed materials in the area. From screws to planks of wood to sheets of ply, he sourced his skatepark materials from local suppliers and businesses. An engineering graduate, he also used YouTube to learn how to use new materials, like marble. 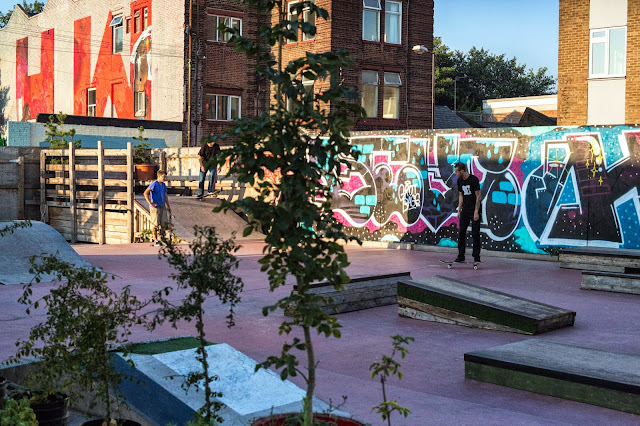 The result: an empty building site turned into a thriving community skatepark—Frontside Gardens. For Hackney Wick families and kids, Frontside Gardens is more than a skatepark. Built by hand from scratch, it’s a place to enjoy a sunny day, learn new skills and make the most of what they've got together. For Andrew, it’s a place to pass down the things he's learned over the years and in doing so, creating a legacy all his own. This entry was posted on Friday, October 18, 2013 at 3:00 AM. You can follow any responses to this entry through the RSS 2.0. You can leave a response.